Last year at this time we looked at the first 10 mayors of modern Newark, covering the period from 1836-57. Today and next Thursday, we will look at the next 10, who served the city through 1894. Over the years the mayor’s office, like the other municipal offices, has become more complicated, carrying with it great responsibilities as well as rewards both for the person and the city. In the early period, the terms of the mayor and aldermen were short. Most were also engaged in in the business, industrial or service world. During this time, there was even a teacher, a librarian and an author. The first 10 mayors 1. William Halsey (1836-37), a lawyer born in Short Hills in 1770, was Newark’s first mayor. 2.Theodore Frelinghuysen (1837-39) was a prominent lawyer, U.S. senator, chancellor of New York University, president of Rutgers University and president of the American Bible Society. 3. James Miller (1839-40), born in New York City, was a Newark alderman, and a prosperous local merchant and 'coachlace' (leather) manufacturer. 4. Oliver S. Halstead (1840-41) was born in Elizabeth. A lawyer by profession, he served in the state legislature, functioned as Essex County surrogate and was the first recorder of the City of Newark. He served in the New Jersey Constitutional Convention of 1844. 5. William Wright (1841-44) was born in 1770. He manufactured surveying instruments and was a justice of the peace and later city surveyor. 6. Stephen Dod (1844-1845) owned a company that manufactured surgical instruments. He also was a state legislator, a justice of the peace, and the city surveyor. 7. Isaac Baldwin (1845-1846) was born in 1779. He was an important manufacturer of jewelry and president of the trustee board of the First Presbyterian Church. 8. Beach Vanderpool (1846-48) was president of the old Morris and Essex Railroad and the promoter of the Newark Gas Company. 9. James Miller (1848-51), who served previously as the city’s third mayor, also was a Newark alderman in the old Common Council. 10. James M. Quinby, originally from Orange, was owner of the great Quinby Carriage and Coach Co., which manufactured some of the nation’s finest 19th century coaches. He served as mayor from 1851-54. The next 10 Newark mayors cover the period from 1854 until 1894, from Horace J. Poinier to Joseph E. Haynes. It was one of Newark’s most dynamic half centuries, for at that time Newark grew from an oversized country village to New Jersey’s undisputed metropolis and one of the nation’s leading cities. Its industry and commerce developed to impressive proportions and it simply became the smart place to live, work and do business. People came to Newark for the advantages offered within its boundaries. It was the time for the building and expanding of its streets, street lighting, schools, the library, water supply, the sewer system and the like. It was a period when, frankly, Newark had really begun to grow up and was getting better and better, day by day. Poinier (1854-57), the 11th mayor of Newark, was the last of the annually elected chief executives. He was born in Newark in 1810 and was of French Huguenot descent. He made his fortune in the lumber business along the Passaic River, and his company grew into one of the largest building and supply businesses in the region. Poinier served as a member of the Common Council and as Essex County freeholder before becoming mayor. Unfortunately for him, he was elected during a serious outbreak of the Asian cholera, when the city was on the verge of a health panic. Distraught Newarkers were besieging the mayor and council with all sorts of suggestions as to what to do, attributing the problem to dirty streets, poor garbage collection, sinful living, a bad water system, and even the lack of attention to the enforcement of the Sunday blue laws. Poinier rode out the storm, and in the long run, earned the respect of the local gentry; however, because of his steadfastness, found himself as leader of the 'Law, Order and Morality' party—a position he did not particularly relish. In addition to his interest in his lumber business, and serving as the city’s chief executive, he was also president of the Newark City Insurance Co. and a founding member of the former Howard Savings Institution. He was an active member of Old First, and for a time Sixth Presbyterian Church. He died in 1893 at the age of 83. Moses Bigelow (1858-64) was the 12th mayor, of German and Scandinavian stock, and has been described as the 'last of the antebellum mayors' and one of the 'war mayors,' a term used to cover the Civil War era. He was also the first mayor elected for a two-year term instead of annually. Born at Lyons Farms, Clinton Township, in 1800, he attended school in the old Lyons Farms Schoolhouse now in the Newark Museum garden. Like many of his counterparts, he was a successful businessman, beginning in the wholesale grocery business. His later clothing business survived the great national panic of 1837. Much to his satisfaction, he paid off all his debts and creditors. Bigelow’s other business ventures included helping in the incorporation of the Morris and Essex Railroad, the Mechanics’ Fire and Marine Insurance Co., the Howard Savings Institution, the Republic Trust Co., and the Newark Gaslight Co. Outside business and government, he served as the first president of the New Jersey Society for the Prevention of Cruelty to Animals and as trustee of Trenton State Asylum for the Insane. After being elected mayor in 1856, he served three two-year terms. He inaugurated a system of block maps for taxation and house numbering, procured the establishment of a sinking fund to rid the city of debt, city debt, and pushed the purchase of a private water company for the creation of the Newark Aqueduct Board. Bigelow also helped organize the modern police department, directed the codification of city ordinances, negotiated important loans for Newark during the Civil War, and greeted Lincoln on his visit to the city. Still, he had time to read. He was a supporter of the Franklin Library Society, the old Newark Library Association (precursor of the Newark Public Library) and was a good friend of the New Jersey Historical Society. Theodore Runyon (1864-66), 13th mayor of Newark, like Mayor Poinier, was of Huguenot stock. He was chiefly occupied with the law throughout most of his lifetime. Runyon, who served two terms as mayor, was born in Somerville in 1822, educated in New York and New Jersey. He was a graduate of Yale Law School and later read law in the Newark office of Asa Whitehead. He did very well at his profession and was later appointed city solicitor for Newark. In 1860, he served as a presidential elector, and voted for Stephen A. Douglas in the Electoral College as opposed to Abraham Lincoln. His military reputation resulted in his appointment as brigadier-general of the Essex County militia. He raised a company on April 15, 1861, at the request of President Lincoln, to defend Washington, D.C., in case of more Confederate victories following the Battle of Bull Run. One thousand men in colorful uniforms followed him to Trenton and then to Washington where they built the capital’s first fortification to the south of the city in Alexandria, Va., naming it Fort Runyon. He and his men returned to Newark on July 25th to 'a rousing welcome.' Thanks from President Lincoln included the offer of a federal cabinet appointment. New Jersey Gov. Thomas Olden promoted him to major-general in charge of the National Guard, a position he held until his resignation in 1875. Runyon’s popularity remained constant and he had now become a major force in the Democratic party. 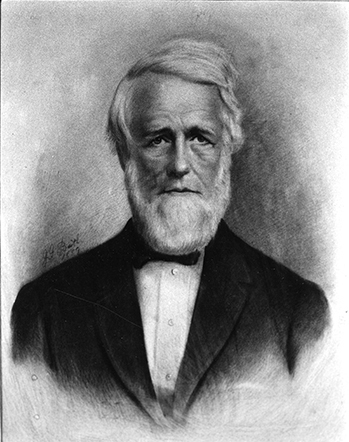 Thomas B. Peddie, the 14th mayor of Newark, from 1866 until 1870, was described as a prosperous and public-spirited manufacturer. He is probably best known for endowing Peddie Academy in Hightstown and for his generous support of Newark’s First Baptist Peddie Memorial Church. As one of several Newark mayors of Scottish origin, Peddie had heard stories about America and its opportunities. This drew him here to make his fortune. He arrived in the United States in the 1830s, visiting several manufacturing towns before selecting Newark as his new home. Almost immediately, he began working at Smith and Wright leatherworks. He later began his own business which soon grew into one of the nation’s largest leather processing enterprises. Peddie was largely responsible for funding the incredible church that bears his name, a memorial in a beautiful downtown building. Although he became a very wealthy man, he apparently never lost his appreciation of hard and honest work, remaining close to the teaching of his Baptist church background. Midway through his career Peddie visited a number of business enterprises in Great Britain and on the continent and reported his findings to the Newark Board of Trade. A Republican, he was twice elected mayor, for three terms in the New Jersey General Assembly. In 1876, he was sent to Congress. His steady hand on city government was missed after leaving office, but his memorials live on in an outstanding private school and a beautiful church. Frederick W. Ricord (1870-74) was the 15th mayor of Newark. He was born on the French West Indies Island of Guadeloupe, where his grandfather was a prominent French subject until the fall of the Girondist Party in 1794. Subsequently, he fled to Italy with his family upon the ascension of Robespierre. Ricord’s father was born in Baltimore and married to the daughter of Peter Stryker of Belleville. Frederick was educated in New York and New Jersey, attended Hobart and Rutgers colleges, took a law degree and was admitted to the bar. But teaching pleased Ricord most. He wrote several nationally circulated textbooks and read and translated 12 languages and spoke five of them fluently. In addition to being a teacher, he was a librarian at the old Newark Library Association and secretary of the New Jersey Historical Society. Ricord’s name is prominently mentioned throughout historical 19th century publications. His love of good literature earned him the reputation of being Newark’s literary mayor. In 1852, he was elected a member of the Newark Board of Education. He served in that post for 17 years. He was also appointed state commissioner of public schools. Later, when he was elected mayor, he rejected a popular demand to pave Newark streets with wooden blocks as other New Jersey cities had done. He thought this too expensive and vetoed the idea. When the council overrode his veto, he refused to sign the authorizing contracts. One contemporary politician credits his stubbornness with having saved Newark from possible bankruptcy. Ricord died in 1897, a highly respected Newark gentleman.